Remember yesterday, when I posted how I was poised to take the next step? And that the coordinator would call one day this week? Turns out that day was yesterday. So, after many months, after triumphs and setbacks, hours in the gym and in classes and in support group. After hours of research and discussion and waffling. After many nights wondering if I was making the right choice, I have a tentative surgery date. March 26 will be the day, assuming all goes well with the preop physical and I continue a downward trend in weight. I have to admit, though… as excited as I am, I’m also scared. I think it’s natural to second guess yourself when making a momentous decision. Whether it’s buying a house, a car, opting for a double cheeseburger instead of a healthier alternative, or anything, we, as humans, tend to suffer from buyer’s remorse. It is important to note that while I’ve received tons of support from the staff at the doctor’s office, never once did I feel pressured to choose surgery. They were very clear from the beginning that it’s not for everyone and they don’t operate on everyone. That being said, weight loss is not the prime reason for me to do this. It’s a nice secondary reason, but it’s more about eradicating The Beetus. I think that’s what folks don’t understand about my reasoning. I HATE NEEDLES. I hate that the constant testing has left my fingertips in a constant state of little tiny holes. To put it bluntly, diabetes is not fun and I wouldn’t wish this on anyone. The procedure offers me betting odds of being off insulin within two days after surgery. I’ll take that. I immediately felt comfortable with my surgeon, and I just love the exercise physiologists. I’m quick to give them the credit for getting me to the gym as much as I go. Not only that, they taught me the right way to work out. I’m not just going to the gym to throw weights around willy-nilly. There’s a right way and a wrong way, and Ryan and Cory have really taught me a lot. That’s one part I’m not looking forward to… the enforced layoff after surgery. I’m sure I’ll be able to walk, and I will, but between the need to recover and heal, and also the liquid diet, workouts will be seriously curtailed. It is what it is and I’ll just have to work back up to where I am and beyond. My joints will certainly thank me, as will my heart and all the other assorted bodily organs affected by the disease. My advice to you, dear readers, is to take care of yourself. Eat smart, get some exercise, cook your own food and get yourself checked out regularly. Also, if the doctor says you’re at risk for diabetes, take him/her seriously. This is not something you want. Not even close. I’ll go into more details over the next few weeks as the journey continues. In other news, I did something stupid on Monday. When making that yummy buffalo sirloin I managed to broil part of my arm on the oven door. I have a rather half-assed bandage on it, due to size and shape, but it got a little crispy. I haven’t burned myself on an oven since 7th grade home-ec, so that’s 30 years. 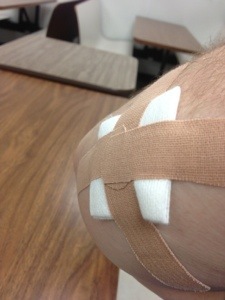 I’ll post a pic of my wonderfully improvised bandage. Be careful in the kitchen, folks!